Tullia D’Aragona is one of the most renowned women writers from the Italian Renaissance. Given the title the “courtesan poet,” Tullia was loved and desired by many poets, however it was her poetry that initiated her lover’s desires. 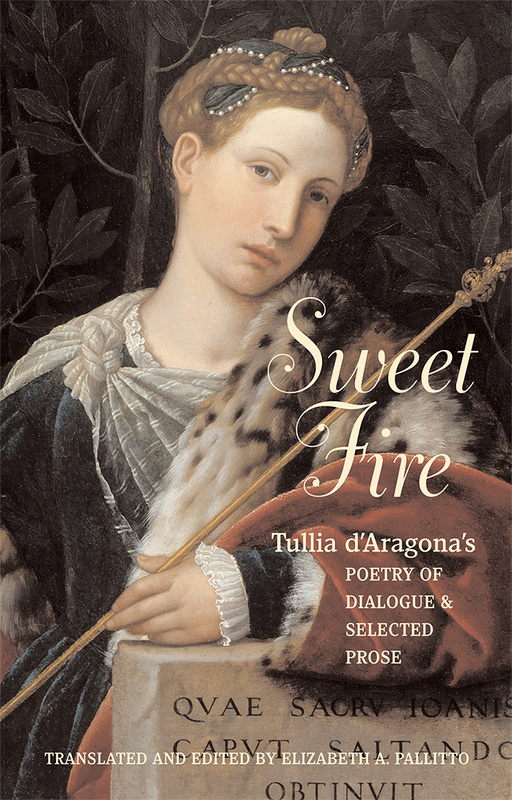 This collection includes fifty-five of Tullia’s best poems and a selection of poems, written to her and by her. The form of Tullia’s Rime, or poetry, constitutes a dialogue in itself: accompanying her poems is a series of risposte (responsive letters) written by well-known men of her day—including Girolamo Muzio, Benedetto Varchi and Lattanzio Bennucci, who offer poetic tributes to her honor, talent, and wit. In these poetic dialogues, Tullia shows herself a match to her male contemporaries verbal, and intellectual dexterity. In a poem written to Piero Manelli, Tullia argues for a female poet’s equal right to fame and literary immortality. In a tribute of gratitude to her muse, friend, and editor—aptly named Muzio—she claims that loving such a talented writer reflects well upon her: “the worth/was yours; but in loving you, the glory mine.” Muzio, in turn, writes an introduction to Tullia’s dialogue on love, using Neoplatonic language to praise the beauty of her mind and the brightness of her soul’s “flame,” refined by hardship and virtue. Elizabeth Pallitto received her Ph.D. in Italian and Comparative Literature from the CUNY Graduate Center in 2003. She has taught English literature, French, and Italian at several universities, including CUNY College of Staten Island, Baruch College, and Boston University. She currently teaches English at Fatih University in Istanbul, Turkey.